Viscuma s. r. o. was founded 23rd February 2007. The company is an entrepreneur of pure Czech origin. The only owner of the company is Mr. Jan Kylar. The company management offers extensive knowledge of injection moulding tasks, the employees know how to manufacture precise thermoplastic parts for electrotechnical industry and mostly for car industry. At the beginning of the year 2008 the nowadays main company building was bought. At the end of June in the same year the building conversion was finished. Afterwards the central cooling for processing machines was built and the production shop was equipped with Arburg injection moulding machines. "To achieve customer´s satisfaction with the help of quality and complex service." We work in accordance with ISO 9001:2016. VISCUMA s. r. o. provides stable quality of all products while the costs stay still low. Company technical equipment used to perform the tasks is kept in repair to stay in a good condition and the company expends the equipment range. The quality of parts is monitored with the help of control system, the company maintains good relations with customers during implementation of production. 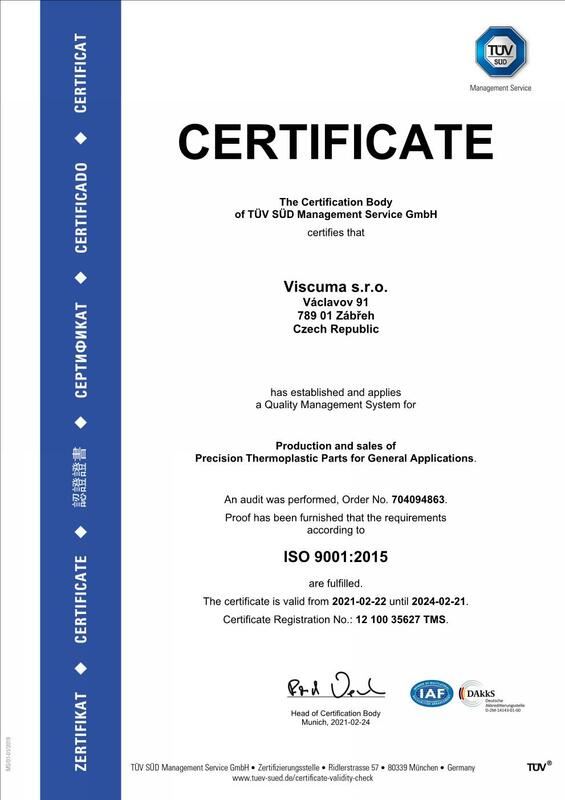 Quality management system helps to keep the manufacturing process and support activities on a high level and improve it in compliance with ČSN EN ISO 9001:2016.